It takes a lot of time and hard work to develop a blog and gain a readership. For most bloggers, this dedication needs to be justified by providing a stable income. I first started using blogging platforms myself in 2006. My first proper blog was a travel blog that I updated frequently for friends when I was travelling Asia and Australasia. I also developed some small content websites using blogging platforms in that same year. It was not until 2007 that I launched my first commercial blog. I knew that I could make money with the blog, but if I am completely honest with all of you, I never really looked too far into the future and considered how I would actually make the blog profitable. Thankfully, I was able to learn through experience and make the blog profitable over the first year. Today I would like to share my experience of developing profitable blogs over the last seven years and show you the most common ways to monetize a blog. If you stopped anyone in the street and asked them how a blog makes money, I would hazard a guess that the majority of people would give the response “Banner Ads”. This would actually be a fairly accurate answer; though it does not tell the whole story as banners are displayed for a variety of reasons. A blogger may be promoting their own products through banners. Alternatively, they may be promoting the product or service of an advertiser. Many blogs sell text links too, though this has become less common due to Google’s policy on selling links. Advertising space can be sold directly to advertisers. Blog owners normally charge advertisers a fixed fee or charge per thousand impressions of the ad (cost per impressions are frequently referred to as CPM). For example, an advertisement with a CPM rate of $3 would cost $300 for one hundred thousand impressions. I am a big fan of selling advertisements directly as it brings in a stable income every month. Be aware that if you sell through an advertising marketplace such as BuySellAds, the service will keep a percentage of your income. BuySellAds, for example, take a commission of 25%. This is sometimes a small price to pay for the sales they generate, though I would still recommend trying to sell your ads yourself before using a marketplace. 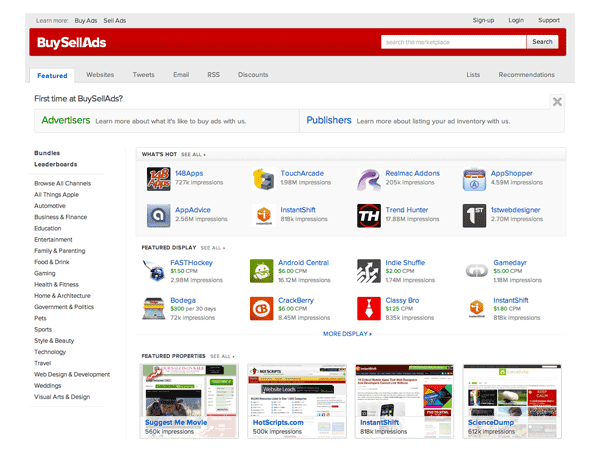 BuySellAds is a blog advertising marketplace that is used by thousands of bloggers and advertisers. An alternative to selling advertisements directly is to display advertisements from an ad network. Google Adsense is by far the most popular option for bloggers, however there are many alternatives such as Chitika, Kontera, and BurstMedia. Advertising networks normally pay on a per-click basis or a CPM basis. Due to this, income generated from advertising networks will vary month to month. For most bloggers, I would recommend using advertising networks to fill any advertising inventory you cannot sell directly to advertisers; however the key is obviously to test all avenues. Google Adsense is used on many blogs. Do not underestimate the potential of integrating affiliate links into your content. For one of my old blogs, affiliate income represented around 75% of my total income due to the number of reviews and tutorials I had written. Be sure to place a small disclaimer on your blog advising readers that you may use affiliate links from time to time. You will find that the vast majority of readers are happy about this as they know it supports your blog. 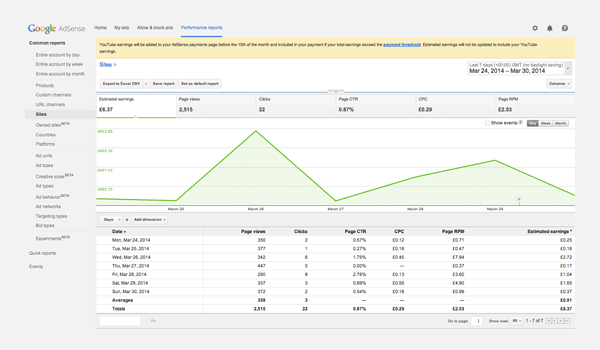 Pretty Link is a great way of masking affiliate links and tracking how many times a link has been clicked. 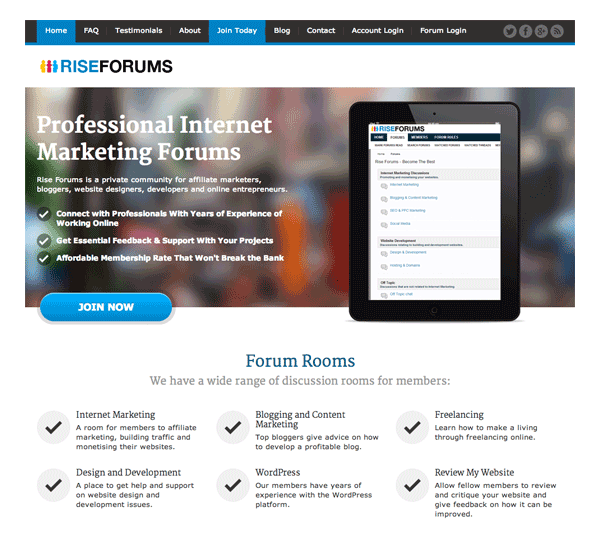 I promote my discussion forum Rise Forums heavily through my personal blog in order to drive traffic to the website. Blogs are also a great platform for marketing services. I have generated thousands of dollars through my blog for additional freelancing and consultation work. There are a lot of people within internet marketing who are also making great money through speaking gigs and one-on-one coaching. Your blog is a place for you to market yourself and promote the experience you have. There is a lot of people out there who are willing to pay you for your knowledge and time. I therefore recommend offering services to readers to supplement your income and raise your profile as an authority. 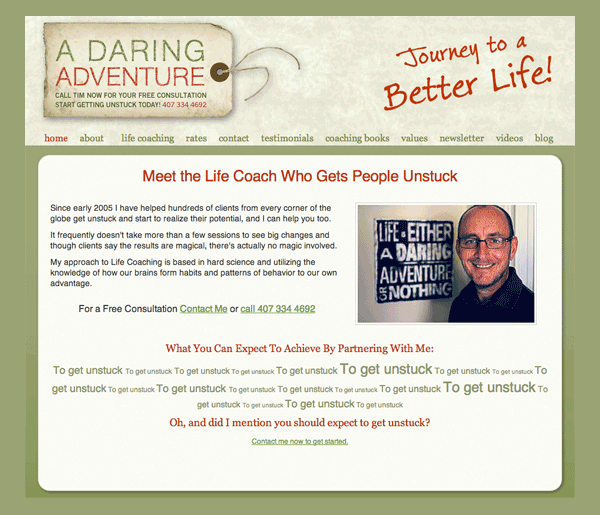 In addition to selling books, Tim Brownson uses his blog “A Daring Adventure” to market his services as a life coach. Once you have an established level of traffic, you will find more and more doors opening for you. One way to take advantage of your traffic is to launch a dedicated job board, classifieds or marketplace. They are easy to set up and allow people to advertise, buy and sell items. Once the marketplace has become successful, you can charge users for posting ads. 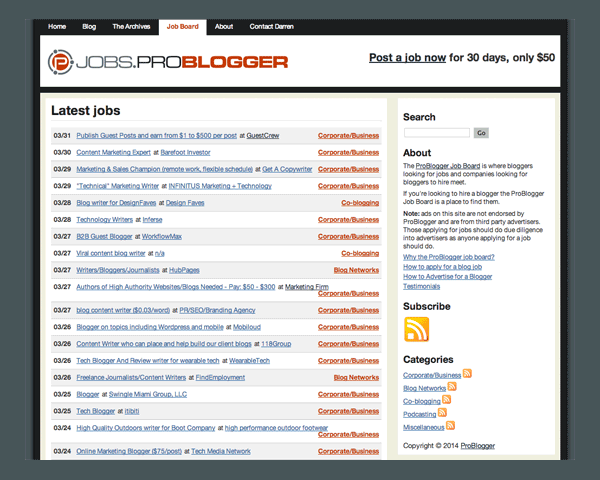 ProBlogger generates thousands of dollars of additional income every month through its job board. In my experience, it is always better to do sponsored reviews to ensure the quality of content remains high. Paid posts tend to be nothing more than poorly written advertisements. Though on the plus side, paid posts are an easier way to make money as you simply copy the article onto your website and click publish. 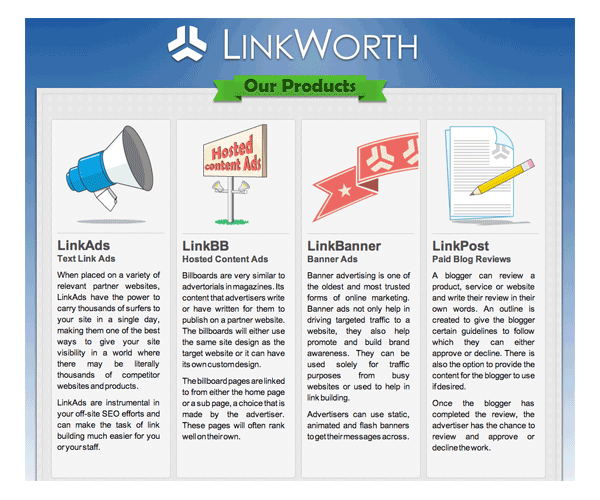 LinkWorth lets you charge advertisers for reviewing their product, website or service. Ebooks and membership websites are not the only way to profit from good content. You can also charge readers to access your best articles. I have seen a wide range of blogs selling premium content in this way. 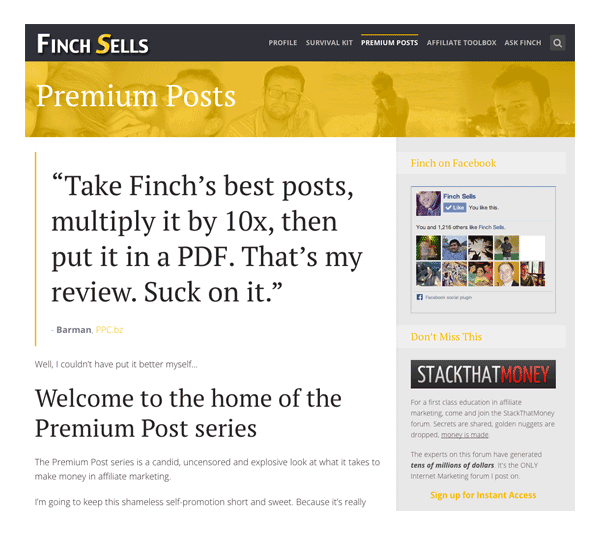 For example, within the affiliate marketing world, Finch Sells is known for charging for his best content. It is very common within the fitness world too. Finch is a highly respected affiliate marketer; which is why many people are willing to pay to read his articles. Email marketing is the ultimate marketing tool for bloggers. 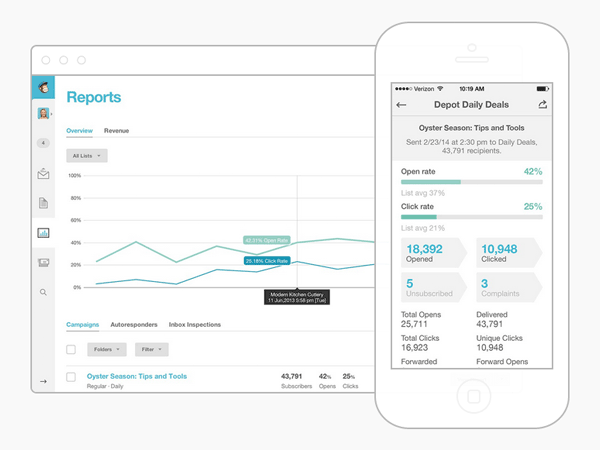 It allows you to instantly deliver your message directly to the inbox of readers. This makes it a more powerful marketing tool than Facebook or Twitter. MailChimp is a great solution for new bloggers as they allow up to 2,000 subscribers free of charge. Lastly, I would like to talk about the possibility of selling your blog. If your circumstances change and you need more time or more money (or both), you could make good money by selling your blog. There are many factors that are considered when a potential buyer prices your blog. I have over $200,000 in sales on Flippa and around $150,000 of those sales came from blogs. In my experience, the biggest influence on the final selling price is income. If your blog is making money, you will have buyers fighting against each other in order to win the auction for your blog. Conversely, if your blog does not make much money, there is a good chance that you will be the one spending all your time asking people to bid. It is therefore always better to sell your blog once it has become profitable. 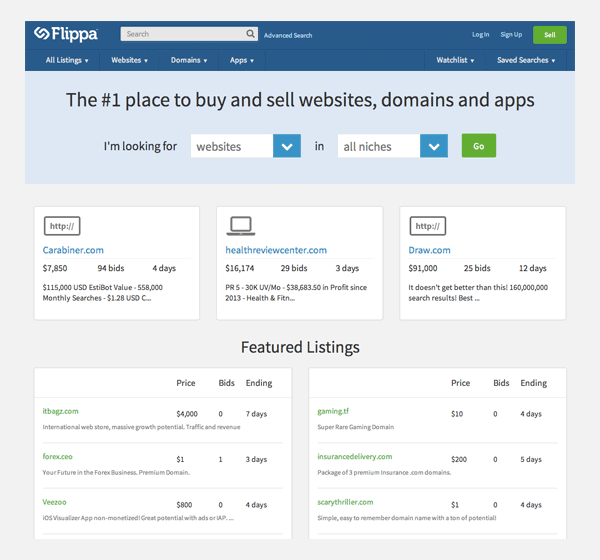 Flippa recently doubled their fees, however their marketplace is still popular for selling blogs. I hope you have enjoyed this article on monetizing your blog. I tried to touch upon the main ways that bloggers monetize their blogs, however there are many other methods. When it comes to making money from your blog, you are only limited by your imagination. Good overview and lots of useful ideas. I only use affiliate sales to monetise my blogs and my biggest seller recently has been the Divi theme. Getting lots of interest and lots of sales via my posts on Divi. I still don’t make enough from by blogs to provide a full time living but I am working on it and looking forward to making a big push when Divi 2.0 is released…. I have really thought about doing an affiliate website. I have just been so impressed with ET with what they offer & their service! I think when you believe in a company …. it makes a difference ‘spreading the word’. Bit snowed under with http://affinityshop.com.au/ at the moment. But I am definitely wanting to do an affiliate website with plugins & wordpress themes included. WordPress is great. Combined with ET it’s excellent! How have you gone Keith? Quit your day job or just a nice trickle … if you don’t mind me asking? No I still have a full time job and I don’t think that any number of affiliate sites could ever match a full time salary. Best of luck Keith. It takes time to grow a stable affiliate income through a blog, but it can be a big earner when you do so. If you keep doing great reviews, your affiliate income will grow and grow. I quite appreciate your contribution to this discussion. I am a new blogger trying to expose my endowment through blogging but i need to start making money on time. Do you mind advice me more? New terms of online monetization is poping up everywhere. We the online marketers has to stay focus. However Job well done Kevin for informative post. Thanks so much for the article! I’m a new Blogger and your ideas are a great way to help me grow and earn an income from my blog – iheartfilm. Glad you liked the article Donna Marie. I have always been curious about how people monetize blogs. For me, I blog primarily to attract new visitors and keep current visitors coming back to my website so they will purchase my services. However, this has reignited my curiosity about how to create passive income as a blogger. Can you list any other good sponsored review sites? It’s worth adding some additional income streams wherever you can. SponsoredReviews is still operating. You might want to check them out. Wil, Australasia isn’t a typo. It’s a reasonably common geographic term used to describe the region of Oceania comprised of Australia, New Zealand, the island of New Guinea and neighbouring islands in the Pacific Ocean. Another awesome post! Great stuff, you guys. I really want to start referring people to your stuff, I just have hesitations about putting my SSN on a website. Merci pour ce retour de ton expérience, il est vrai que monétiser un blog n’est pas chose facile. Surtout quand on ne souhaite pas déranger l’utilisateur dans sa navigation. poor creative for this team developer… where is new theme hah? i’m and many friend is NOT HAPPY WITH you until not create new theme!!!! You can read about what new themes and updates we are working on in our Sneak Peek category. You can cancel your membership from within the members area. If you are a new member, you can request a refund here. sick! this not about money! not about refund! but this about your promise! about your commitment! Our promise is to make the best themes we can, which is exactly what we are doing. If you are not happy, a refund is the best thing I can do for you. I realise that many Elegant Themes customers want new themes released as soon as possible. Though isn’t quality more important than releasing a theme early that is incomplete? I NEVER comment on these blog posts. I take value from the ones I can and stop reading the ones that don’t interest me… I can however say that I spent 11 months at the “Developer” level of access, and upgraded to Lifetime Member just before the blog entry that informed us of the pending price change for the lower rungs. Elegant Themes as a company has satisfied ME as a paying customer! You, Mr. Uptemplates are likely NOT a paying customer and your mean spirited comments that jeopadise the profitability and sustainability of a company that provides the rest of us with a meaningful living are not appreciated. So take your NOT HAPPYness to another company that will charge you $50 per theme and be unhappy there. I have a lifetime membership and haven’t begun to use all of the current themes available. Not sure how anyone could use every permutation to exhaustion and still want more?? I’ll fade back into the murky shadows now, where I gratefully read without contributing. Thanks to Nick and team! Awesome tips Kevin! A buddy asked me if blogs can put foods on your table and I told him yes provided you do it right. This article has exposed me the more however, you didn’t mention the operational expenses or many nifty plugins needed before the blog can be profitable. Thanks for this great insight, much love. Thanks bb. Glad you liked it. The only costs that are absolutely necessary for a blog are a domain name ($10 a year) and hosting costs ($60+ a year). Premium plugins are not necessary to run a profitable blog. They might help with some things, but there are always free alternatives. I struggle with the concept of relevance & ‘sell out’ in regards to advertising. I would think ads would be viewed quite differently to ads placed on a blog. One day I may have to look at this prospect. Ads relevance would need to be upheld I would think. They will definitely be viewed differently on a blog. It makes little sense to display advertisements to your customers as it means they are less likely to buy the products you are trying to sell them. Their are various kinds of ad captcha programs like Solve Media which help you to earn money when a user enter a captcha on your website. You can integrate this in comments and contact us section. This can give you an extra bit of cash. Nice suggestion Adrian. I have never heard about that before. It seems like a good idea. I’m not sure how much money it would generate every month; but every little helps. I would like to thank you for nice post , I really enjoyed. I’d like to increase my cash income from my blog. I do far better in the value of free products and trips in exchange for my reviews than cash in pocket. My best income sources (all things considering) right now are sponsored posts, reviews, and private ads. Ad networks and affiliate sales do not bring me nearly as much. If you are looking to increase affiliate income, my advice is to write reviews of products that have an affiliate product. A very useful and comprehensive article on a very captivating subject. I have been working both with banner ads and affiliate marketing and both of them offer real potential if they are carefully matched to the right kind of blog and targeted visitors. Nice article as I am a new comer to blogging. These are all great things to think about for monetizing content. We actually just launched a WP plugin that gives another option for content monetization: CoinTent micropayments. We allow you to sell individual pieces of premium content (articles, blog posts, videos) through micropayments ($0.05-$1.00) as a direct source of revenue. Sounds good. I’ve always been curious as to how micropayments work in certain websites. Kevin you should make a part two of this especially with all the activity from Google effecting the blogs. Great post, though I’d like to see a section on donations/subscriptions. Many of the suggestions above have a lot of content and UX implications for writers who are sensitive about the trust between them and their readers. Kevin, can i mention that I’m currently working on a platform marketplace of bloggers and social media engagers, who are looking to monetize from their blog and other social media platforms. Check it out on http://www.Quickshouts.com/prototype. We still starting it up, and people are jumping on board now as they realise this opportunity. Free to join. I think this will help bloggers earn money within their niche and gain more exposure to their blog as well. Nothing to lose here. Kevin i got intrigue with the highlight you gave on how to monetize ones blog, great stuff i think. But i want step by step training on how i can make same 7 figure from my blog in (fb) just as you do, can you stand by my side to achieve this goal of mine? This post i think covered almost every single technique or method of monetizing our blog. Will surely , goings to apply any suitable technique on my blog to earn from it. Thanks kevin for sharing all this. Keep doing good work bro! Thanks for the post – great read and super informative. Really, really good post. I’m trying to stay away from monetizing my blog until I believe it is mature enough (it’s still really new). But I’ve been working on networking and advertising to fish for a solid userbase. Great post. I’ve just launched my blog recently and was looking at options I have to monetize in the future. Seems like I have a lot to do before I start doing that. Building content and trust among my audience should be my priority now. Great article! One of the issues about monetizing a Blog is the choice between Google AdSense, and Banner / Link Ads. I have yet been able to figure out what Google’s policy is concerning mixing their Ads, and – in my case – Blog appropriate Banner Ads. Any insight? Thanks in advance for your response. I am relatively new to blogging and am thinking of starting my own blog — I looked at WordPress though and it says it limits your opportunities to be profitable. Is this the case? Do you have to use their system? If so, can you recommend another place to build my blog? I uses blogger for my blog and i want to know if some of the monetizing site mentioned above can be use on blogger.com? Because google adsense have not approve my blog for monetization and i want to create my own advert banner without using google adsense. This is because i have relative who are willing to advertise on my blog and i am willing to do it too so that i can use them to get customers outside the internet. So do you think those monetizing site will work on blogger.com? And i will also like to know if it is possible to create advert banner on my blog without using google adsense? This post was very informative! I hope one day to have enough followers where I might be able to put some of these in to action. Thanks for the Tips! Helpful knowledge. But… What I really need is advice on HOW to add those things to my blog. How do I add ads from local advertisers? 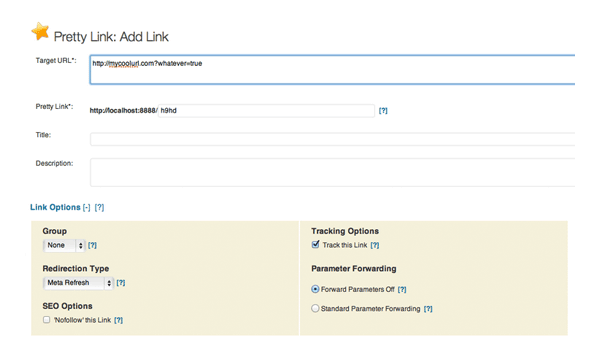 How do I add referral forms? Affiliate links? Google ads? Nobody seems to be teaching how to do these things. I just want to put them on the site and be done with it, so I can spend my time writing entertaining content. Would you say that wordpress is still the better platform when building a blog that would promote affiliate products? Also, if I can’t afford buying my own domain name yet, is it okay to use blog.wordpress.com at the start? I would like to add that it depends also on the topic of your blog. I’m using AdSense in my blog (how to make money with binary options trading) and the RPM is over $20 (I guess is not a bad one) but I saw people with a very very low RPM (around $3 at most). Anyways, I’m thinking about getting into Amazon affiliate. you basically listed every method to make money with a blog. Selling ads and sponsored posts are what work best for me. No new information, but a good brush up of the basics. Definitely are a lot of ways to monetize a blog – many more than the 2-3 people usually think of. These are amazing ways to earn some additional income from my blog. I use some (not all) of them in the listed points.